"Three airstrikes hit an uninhabited area in the west of Gaza City, Tuesday morning local time, 13 November 2012, so it does not cause casualties," Palestinian security sources and witnesses said. "Targeted attacks Israel, among other things, is a training camp Ezzedin al-Qassam Brigades. Brigades is the military wing of Hamas, the Palestinian territories," said another source. 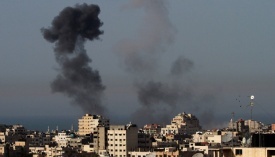 Israeli spokesman said, fighter jets struck an arsenal of weapons and Gated launch two rockets. Air attack lasted several hours after Palestinian militants, Monday, November 12 2012, fired six rockets into southern Israel. Rockets fired on Monday, claimed by the Popular Front for the Liberation of Palestine, the Democratic Front for the Liberation of Palestine, and the Popular Resistance Committees. The main groups of Palestinian fighters in the Gaza Strip on Monday, saying that they are ready to do a truce if Israel "to stop aggression" against the Palestinian territory. "Islam and nationalist movement confirmed that they were responsible for the attack, depending on the State Zionist aggression against our people continue or not," they said in a statement read at a news conference in Gaza City. Palestinian militants fired a rocket into Israel, last week, left eight Israelis were hurt. The shot was rewarded Israel with air strikes that resulted in six Palestinians were killed on Saturday.